Why is it that when I see a critters image, it HAS to go in my cart? There are other images such as flowers to use but flowers just do not have the laugh factor. 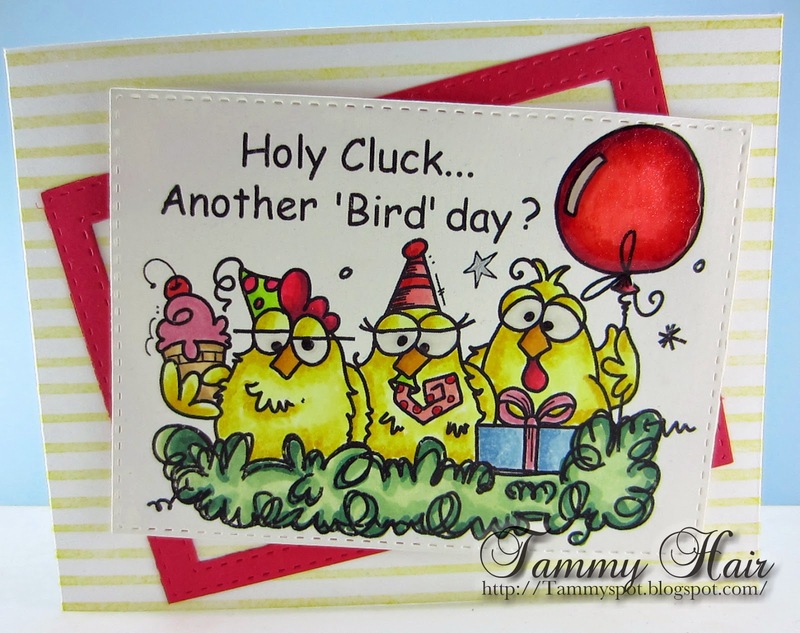 I used Chickz - Holy Cluck Another Birdday from Bugaboo Digi Stamps to create today's card. Personally, I think these chickens have had a little too much of something and I don't think its cake! What an adorably fun card! Love that sentiment! What a hoot! Fabulous card, Tammy, and sure to bring a smile. What a fun card! Great coloring! Lol! As your card started to load on my page, I chked on my tea! Hilarious! I love love love it! Hahahahahaha! Party hearty! Yup, me and critters have a thing going on, too. I love my flower stamps, but if not flowers it's probably critters. Love these guys! What a cute card! Too, too fun, Tammy! I love this celebrating chicks! Yes,I think you are right by looking at their eyeballs....they sure look like they spiked the punch!! LOL!! this is just too fun! I think someone spiked their drinks too. Love the sentiment with this super fun image.